Visitors to the Slaton Harvey House have an opportunity to experience firsthand one of the lesser known Fred Harvey merchandising successes – the Harvey newsstand. The Slaton newsstand remains intact along the west wall of the area that was once the Harvey lunch room. 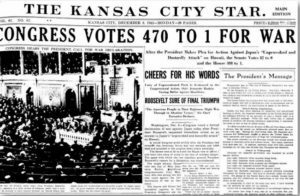 In a sense, Fred Harvey newsstands were the twentieth-century forerunner of modern-day convenience stores. 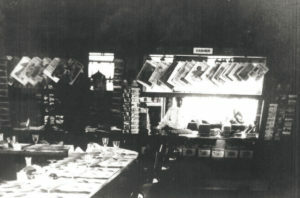 In most Harvey House locations, the newsstand was inside the Harvey Lunch Room; however, in larger train depots, it was usually a separate shop that opened into the depot waiting room as well as onto the trackside platform. The amount and variety of merchandise offered was in proportion to the number of passengers passing through the train station. The first Fred Harvey business in Texas was a newsstand that opened in the Paris train depot in 1896 and operated until 1930. There was no Harvey eating house at this location; however, just thirty miles north in Hugo, Oklahoma, there was a Harvey House Lunch Room with a newsstand. One other Texas location, Beaumont, had a Harvey Newsstand and no eating facility. It is the only Harvey business in Texas that was associated with a hotel not owned by the Fred Harvey Company. The newsstand is listed in a 1905 promotional booklet titled Fred Harvey Meals, as being located in Beaumont’s new Crosby Hotel. The five-story brick Crosby Hotel was built soon after the Spindletop oil boom of 1901. The Crosby Hotel lobby would have been crowded with men frantically competing to take advantage of the great Texas oil boom. 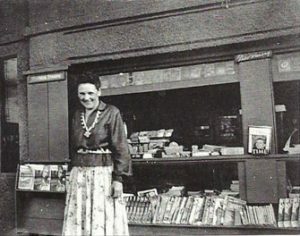 One can only imagine the burgeoning business enjoyed by a Fred Harvey Newsstand, with its sophisticated stock of cigars, cigarettes and current newspapers brought in by train from such faraway cities as Chicago and Kansas City. The Harvey newsstands also offered major newspapers of the time as well as a variety of magazines and books. 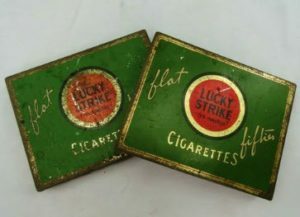 Chewing gum and candy were big sellers, and the newsstands were always framed with wire displays of postcards. The postcard business flourished after 1904 when Ford Harvey began working with the Detroit Publishing Company, which had developed a process for colorizing black-and-white photos. 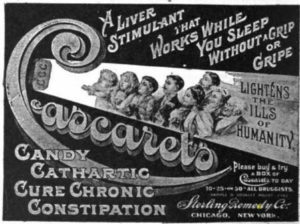 A good number of the collectable postcards from the early Harvey days have survived and are often offered online. Souvenirs were attractively displayed to appeal to train passengers. Key chains and letter openers as well as figurines and toy trucks all clamored for the travelers’ attention. Displayed on glass shelves, small items were advertised as souvenirs for bridge prizes. The variety of merchandise was endless: cloisonné compacts, sewing notions, watches and brightly colored felt triangular pennants emblazoned with the state’s name. Small cactus plants were sold in the El Paso Union Station Harvey newsstand. 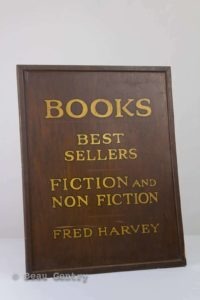 Fred Harvey newsstands were a very successful business, and throughout the Harvey system, many survived long after lunchrooms and dining rooms had closed. Next time you walk into the Slaton Harvey House take a moment to observe another of Fred Harvey’s brilliant business initiatives. Mr. Harvey didn’t only “feed the trains” – he also provided for the personal needs and wants of the train passengers.